Hubby and I recently returned from a cruise on Royal Caribbean Voyager of the Seas, sailing from Galveston to three ports in the Western Caribbean. Although we’ve cruised many times, this was our first experience as part of a large group from our home community. 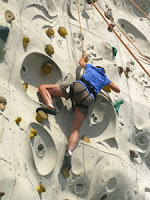 We’re fairly independent travelers and have learned what activities we especially enjoy onboard and in port, so we weren’t really sure how it would all work out. While relaxing is certainly prime on our itinerary, we also relish the opportunity to explore new places and try new adventures. 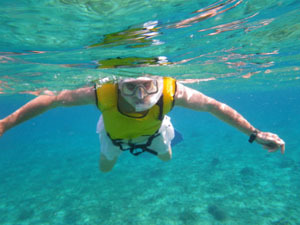 Still, we know what each person or couple wants from a cruise is different, so everyone was free to set their own pace. 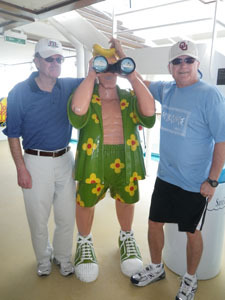 Actually, we enjoyed sharing tips with cruise newbies and helping friends become acquainted with the ship once onboard. Our group of 31 people decided to get together at the Schooner Bar (which became our default meeting spot) right after the required muster drill on the first day. As always, showing up was optional, but it was fun meeting up with friends on the ship and sharing details of everyone’s daily activities. We also split for dining--some preferred early seating, others chose late, and a few opted for flexible dining times. We dined each night with one specific couple, but even so we shared a larger table allowing us to meet a variety of interesting people from many different states. 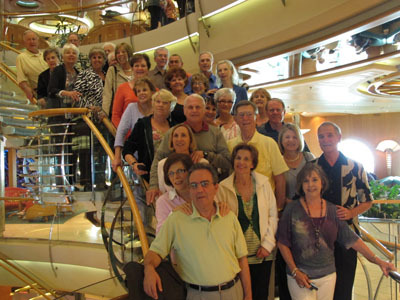 Some of the group attended the evening shows—comedian, song and dance reviews, ventriloquist, ice show, and more—while others chose to stroll along the Promenade, sing karaoke, or try their luck in the casino. With such a large group, freedom of choice was the only way to go. At Cozumel, our first port, some of our friends decided to shop and then meet for drinks at a scenic restaurant near the beach—a fun afternoon spent sharing stories and laughs over salsa, guacamole, and Mexican beer. On the other hand, we had a marvelous time observing coral and fish on a Three Reef Snorkel Tour. 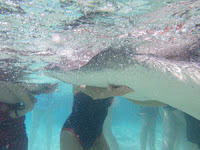 Although we had been to Sting Ray City from Grand Cayman two other times, we had so much fun that we went back—adding snorkeling and a visit to Seven Mile Beach to the tour. A few couples pooled their resources and hired a van and driver for an island tour. This cruise was our first time to stop at Montego Bay in Jamaica, the third port. 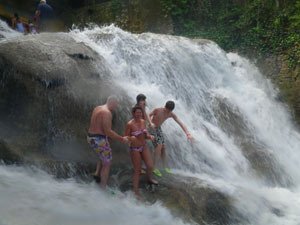 Our sense of adventure led us on Jamaica's most popular excursion,a must-do adventure at Dunn’s River Falls near Ocho Rios. At this spectacular spot we braved the flowing current of water and climbed over slippery boulders to the top. Sharing the beauty and excitement with another couple in our group made the experience even better. During sea days, we enjoyed games of ping-pong and miniature golf with friends, lounged by the pool, and chatted with folks from home. I couldn’t convince others to join us climbing the rock wall and ice skating, but we have pictures to document the activities. Seeing familiar faces along the way always made me smile, and the best part is we got to know some of our neighbors better. The memories we all share will be a lasting bond of friendship.